"He's probably still in love with you…" FilmRise has debuted a trailer for a charming romantic drama film titled The Boy Downstairs, from newcomer Sophie Brooks. The film played at the Tribeca and London Film Festivals, and will hit limited theaters starting February. Zosia Mamet (from "Girls", Wiener-Dog, Kate Can't Swim) stars as a woman who moves back to New York City and finds the perfect apartment to live in. However, she discovers her ex-boyfriend happens to be living in the apartment downstairs, and deals with her feelings for him while trying to figure out how to be successful in her own way. The cast includes Matthew Shear as the "boy", as well as Sarah Ramos, Deirdre O'Connell, and Diana Irvine. I saw this in London and it's charming, very quirky, but not that memorable or original in its story, but still good. Diana (Zosia Mamet) moves back to New York after a few years abroad and finds the perfect Brooklyn apartment for a fresh start. Yet on the first night in her new home, she discovers that her ex-boyfriend Ben (Matthew Shear) lives in the apartment below hers. After an awkward reunion, Diana proclaims her intentions for a genuine friendship. As old wounds are opened, both Diana and Ben are forced to confront the true nature of their feelings. 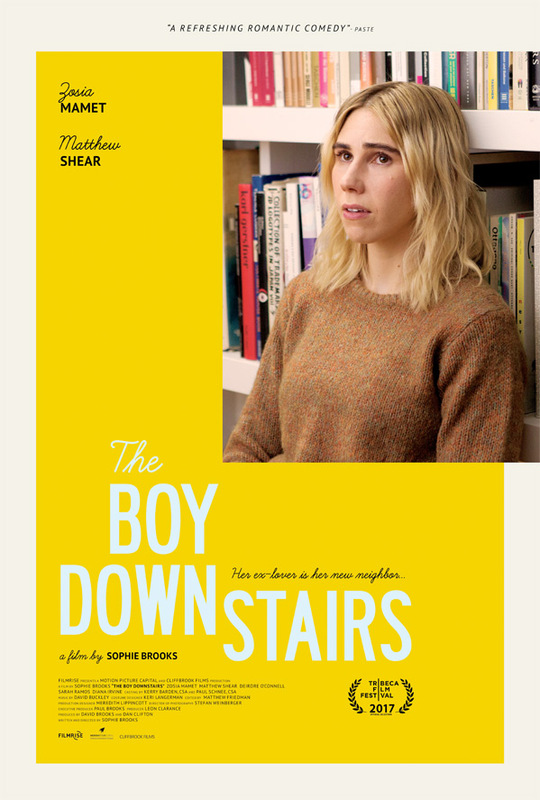 The Boy Downstairs is both written and directed by American filmmaker Sophie Brooks, making her feature directorial debut after a short film previously. This first premiered at the Tribeca Film Festival last year, and it also played at the London Film Festival and Austin Film Festival. FilmRise will release The Boy Downstairs in select theaters starting February 16th this winter. Curious?